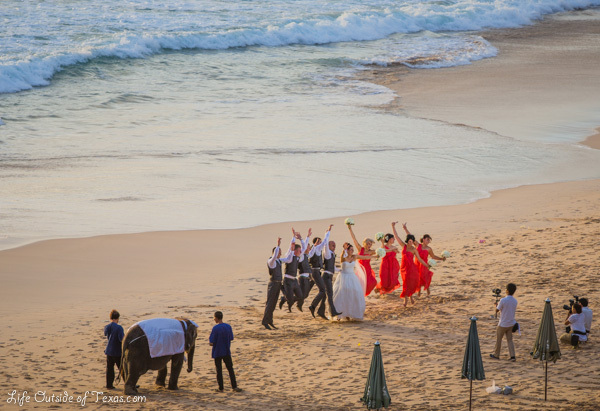 This entry was posted in Thailand and tagged beach at sunset, checklist, destination wedding, elephant, Kata Noi Beach, photography, Phuket, Thailand, The Shore at Katathani, travel, wedding jumping photo, wedding photography by Meagan & Dave | HappilyEverExpat.com. Bookmark the permalink. Well, yeah… naturally, there should be an elephant, right?! That’s right! It was that moment that I decided I’m never getting married unless there’s an elephant on the guest list. That’s it….must get married in Thailand! I know, right? What beautiful scenery. If it wasn’t so far, I’d seriously consider it. hahaha I know, right! Me too! That’s awesome! Love that there is an elephant, definitely a must 🙂 I’m thinking we should have went there for our wedding! That’s awesome! Love the elephant–definitely a must 🙂 I’m thinking we should have went there for our wedding! That elephant has some nerve – wearing white to someone else’s wedding! How rude! My friend is getting married in Thailand in just a few weeks! I think it’s a perfect destination. I found your post comments while searching Google. It is very relevant information. Great work. Regularly I do not make posts on blogs, but I have to say that this posting really forced me to do so. Really awesome post. Really fantastic and I will be coming back for more information at your site and revisit it !